As a Modern Restaurant Management magazine columnist, hospitality expert Geordy Murphy will answer questions regarding restaurant management issues. Send your questions to geo@cypresshospitalitygroup.com. Question: Are there items that make more sense to rent/lease instead of buying? Answer: Not everything in your facility should be “yours” on paper. Renting a dishwashing machine can save you big bucks in maintenance. There’s an added perk, too – the rental company will keep an eye on your soap usage, and calibrate the machine to minimize it while getting everything clean. You wouldn’t believe how expensive soap can be, or how competitive the market is…for a good price and high quality, I’d suggest either Eco Lab or Auto Chlor. Get a quote from both. Dishwashing machines aren’t the only item that you might be better off renting than buying. Let’s go over a few of the items you should evaluate carefully before purchasing – you’d be surprised at the benefits offered by renting in some instances (but not all). Do a quick search online and you’ll notice that every linen rental company thinks you should rent your linens, while every linen-making company thinks you should buy them. The choice between linen rental and purchase is yours to make, but you should weigh a few factors carefully before proceeding. Do you have onsite laundry? Should you? How much would local linen services charge to wash, dry, and press your linens regularly? How much would washing, drying, and pressing your linens cost if you do it in-house? Do you have the staff and equipment necessary? In most cases, a linen service is the way to go, for a few key reasons. Most restaurants don’t have laundry facilities or staff on site (this is different for hotel-operated facilities; they may find it easier to handle their linens in-house.) If your linens rip, are stained, or are otherwise damaged, most linen service companies provide a guarantee – they provide all repairs and stain removal, free of charge. That can add up to big savings in a short period of time. You’ll find linen manufacturers who recommend that you buy your own tablecloths and protect them under glass or hard plastic. I’m not a fan of this look – it feels cheap and looks cheesy. If you have a tight budget and onsite laundry facilities necessary for the job, it might work for you, however. If your staff are responsible for their own uniforms, you can save a little cash on linen cost, too. Just make sure they know how to properly wash, remove stains, and press their aprons and uniforms. You might choose to have a policy where being out of uniform or wearing a sloppily ironed uniform results in being sent home for the day. This can come in handy, but make sure you have the backup staff necessary if you go that route. You might keep a few extra uniforms in various sizes on hand in case of emergency, too. Napkins are hard to keep clean, can stain easily, and could quickly add up to an expensive investment if you choose to go with in-house linen care. You might also find that the only linen service you need is for bar rags and kitchen rags. A restaurant without tablecloths or cloth napkins can save quite a bit on linens – just make sure that your tabletop material is attractive, long-lasting, and easy to clean. Look for ways to carefully cut costs while keeping your restaurant classy and attractive to diners. Linen companies, like everyone else, like to turn a profit. If you use one, don’t pay an inventory charge…negotiate like mad to avoid it. An inventory charge is a fee that these companies charge to stock your shelves and charge you for the linens on they stock – even when you don’t use them. Only pay for what you receive, NOT for extra linen stock. Weigh your choices carefully in the kitchen. You want your team operating with the best equipment, but with minimal investment on your part. Depending on the type of cuisine you are preparing, your chef may require highly specialized appliances – molecular gas- tronomy requires an entirely different kitchen setup than classic French peasant dishes or a sushi bar. Your chef needs to be a part of kitchen equipment selection. Don’t assume that you need to buy everything you use in the kitchen. As I mentioned ear- lier, your dishwasher can be a much more affordable investment if you lease it – especially considering that you’ll get free maintenance and repairs throughout the life of the lease. The same might be true for other kitchen appliances and equipment, from your ranges to the refrigerators your restaurant uses. Leasing equipment offers a few distinct advantages. First off, it’s often tax deductible. The initial cost is lower, allowing you to start up with fewer upfront costs. Lease terms are often flexible, and you might be able to arrange for yearly equipment upgrades, too. On the downside, you’ll end up stuck with the equipment you choose for the life of the lease – even if you spot something better. The only exception is if you can stick a clause in the lease that allows for upgrades whenever you want. You won’t own the equipment, so it can’t help you build equity. The overall cost can be much higher than buying the equip- ment directly in some cases, but if you can wrangle a great service deal, you can minimize the long-term cost difference. On the tax front, although the initial cost of buying your own equipment can be higher, talk with your accountant before making a decision about renting or buying. In some cases, the cost of new equipment is fully deductible in its first year of use. Remember that if you do choose to buy your own equipment, you’re likely to get stuck with outdated appliances in a few years, and may wind up paying through the teeth for repairs and maintenance. Choose carefully, and weigh the costs and benefits for all items before you decide to purchase or lease. What seems like a good deal at the outset could cost you significantly more over time. When analyzing price difference, don’t forget interest rates. If your credit history is good, the difference may be marginal between buying and leasing. If you’ve got a poor credit history, you may pay very high interest rates on bank loans or leased equipment. The only way to know what’s best for your business is to break down the numbers yourself. In my case, buying equipment is usually the right move. Lease payments can be as high as your rent, and the expense adds up quickly. Think long term, and run the numbers carefully. If your budget is tight and you prefer to own your equipment, consider purchasing used appliances and equipment. You can usually find good deals on equipment when another restaurant or eatery is closing and has equipment to sell, or from the same companies that offer leased or new equipment. Check classified ads and Craigslist.com, too. Used equipment can be a decent option if your budget is tight, but it won’t be as nice as new equipment. There’s always a chance that someone is off-loading junk, too. If possible, ask to see the equipment in operation before you purchase. Don’t just look at the cost over one year. You plan on staying in business for a few decades at least, right? Compare how the investments line up over one, five, 10, and 20 years. How often will you buy new equipment if you plan on purchasing? How many times will you need to service it? If you lease, will your rates be locked, or will you be subject to yearly price increases? Run the numbers to find out what option is best in your case. Make sure to perform the same calculation for all equipment – you may find that leasing works well for some items, but buying is better for others. 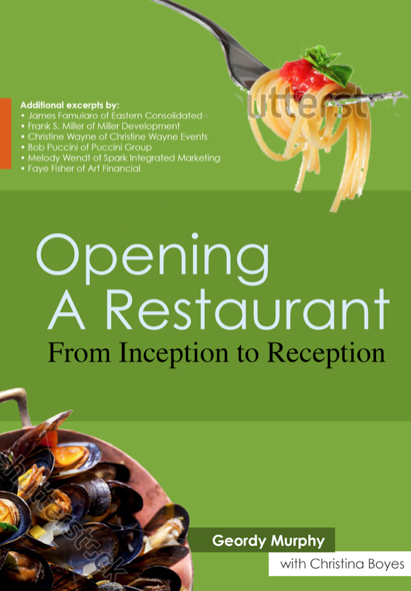 Geordy Murphy, with Christina Boyes, authored Opening A Restaurant From Inception to Reception. The post above is an excerpt. 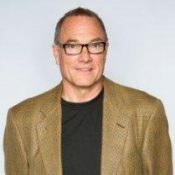 Geordy Murphy is the President and Owner Operator of Cypress Hospitality Group, founder of Fobesoft.com, and a tenured professional in the hospitality industry.